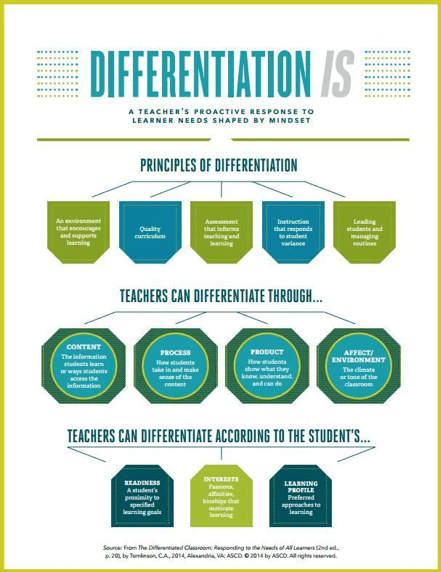 The word differentiation can be heard in schools and educational conferences around the world. It sounds like a big, new concept, but think back to all of those one room school houses that used to and, in some places, still exist. Tomlinson states, “Today’s teachers still contend with the essential challenge of the teacher in the one-room schoolhouse: how to reach out effectively to students who span the spectrum of learning readiness, personal interests, and culturally shaped ways of seeing and speaking about experiencing the world.” Differentiation does not look the same between classes and there is no single strategy that works with all students. 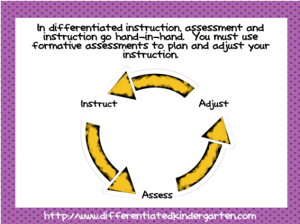 As the idea of differentiation can vary dramatically from person to person, it is important to examine the essential pieces of differentiation to know where to start or how to get back on track. Both the school’s curriculum and the students themselves play integral roles when attempting to differentiate in the classroom. Tomlinson notes two main considerations when differentiating curriculum: clarity and the relationship of assessment and instruction. In order for differentiation to be effective in a classroom, the teacher needs to have a clear understanding and picture of the essential knowledge, understanding, and skills required and knowledge of how those pieces connect to the grades above and below. This clarity supports making sure the students know the expectations and allows for flexibility in moving students up and down a continuum based on understanding and skill development. Knowing where students are in their learning journeys and monitoring to determine whether they are progressing within the curriculum is a crucial aspect of differentiation. Assessment is not a way to give a final grade in a differentiated classroom, but a tool to guide instruction and evaluate the efficacy of an approach. Assessment and instruction should occur dynamically in the classroom and can take many forms such as an exit ticket, mid-module test, or a quick survey in which students self-evaluate their understanding. There are four main things that can be differentiated in the classroom: content, process, product, and affect/environment. The student’s level of readiness, learning profile, and interests should all be taken into consideration when developing differentiation strategies. The first step is getting to know the students, which is typically a part of the beginning of the year routine; however, there may be ways to expand your get-to-know-you surveys, activities, and discussions with the goal of learning more about how students learn and what they enjoy learning about. When embarking on this journey, focus on one area at a time. How can you change the environment for whole class lessons? Group work? Individual work time? What are the different ways to present information to students (videos, articles, different leveled text, audio, visuals, etc.)? Differentiation has existed for a long time and differentiation can be seen in all classrooms; however, as educators, we constantly strive to expand and enhance our teaching repertoires throughout our careers. In terms of differentiation, this type of growth requires a focused effort to re-evaluate our practices and experiment with new techniques in creating more efficient, effective, and supportive learning environments.